Conventional wisdom is that the Republican presidential field is set, and that it is much too late for a new candidate to enter the race. In years past, that would be absolutely correct. Over the last few decades, dozens of primaries and caucuses have been shoe-horned into the opening weeks of the election year, with the tendency on the Republican side for the front-running candidate to score a quick knockout. Similarly, should non-Romney alternatives led by Newt Gingrich, Michele Bachmann and Rick Perry fall flat in the January contests, there would be time for the conservative wing of the party to find a new champion to carry its banner through the bulk of the primary season. In some respects, the layout of the 2012 primary calendar resembles that in 1976, starting in the dead of winter with events in Iowa and New Hampshire and building to a crescendo with California in early June. That year, President Gerald Ford and former California Gov. Ronald Reagan battled delegate for delegate until Ford prevailed at the convention that summer in Kansas City. It was the most closely contested and longest-running Republican nominating contest in the last 40 years. On the Democratic side, the “back-loaded” arrangement of the primary calendar encouraged two late entries in 1976, Gov. Jerry Brown of California and Sen. Frank Church of Idaho. Each won several spring-time primaries. But they mounted their campaigns too late to offset former Georgia Gov. Jimmy Carter’s long lead in the delegate count. Virtually all of the candidate and media attention these days is focused on the early Republican primaries and caucuses. But taken together, they offer only a small fraction of the total number of GOP delegates that will be going to the national convention next summer in Tampa. 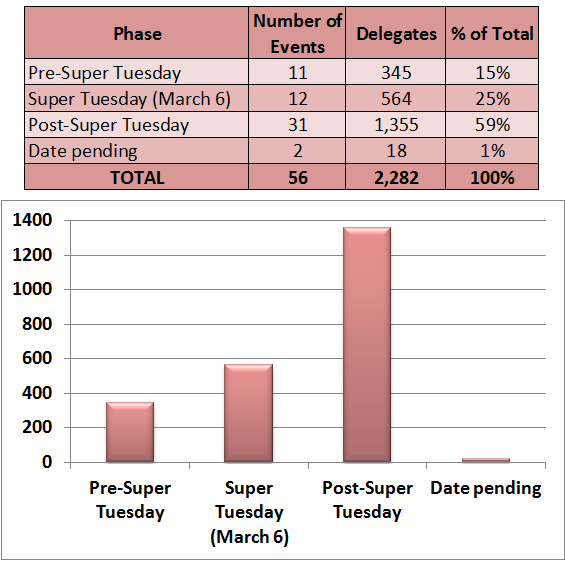 Heading into Super Tuesday (March 6), only 15% of the GOP delegates will have been chosen. The halfway mark in delegate selection will not come until later in the month, and for one candidate to acquire a nominating majority of roughly 1,142 delegates, it could take much, much longer. Note: The number of events includes primaries or caucuses scheduled in states and territories, as well as Puerto Rico and the District of Columbia. As of Nov. 21, dates were still pending for events in Guam and the Northern Mariana Islands, each with nine delegates. Sources: Delegate totals are from the Republican National Committee. Presidential primary and caucus dates are mainly from the Federal Election Commission. Both the delegate totals and presidential primary and caucus dates are subject to small changes. To be successful, a late-starting campaign needs to feature a candidate with considerable fund-raising and organizational ability who is capable of quickly grabbing national attention. Charisma helps, as does a campaign message that can evoke widespread support. Robert Kennedy fit the bill in 1968, and there are arguably a few prominent Republicans on the sidelines this time who could mount a competitive, late-starting candidacy in 2012. These could include one of the establishment non-candidates who Republican elites pressured to enter the race earlier this year, such as Indiana Gov. Mitch Daniels, Rep. Paul Ryan (WI), ex-Florida Gov. Jeb Bush or New Jersey Gov. Chris Christie (although Christie has already endorsed Mitt Romney). The entry of any of these Republicans would cause waves, and because of their high profiles they would have little trouble raising money or attracting establishment support. On the other hand, if Romney gets off to a strong start in January’s opening round, then there might be pressure on the right to enlist former Alaska Gov. Sarah Palin to pick up the anti-establishment baton. The long intermission next February — there are no primaries selecting delegates between Florida on Jan. 31 and Arizona and Michigan on Feb. 28 — provides a natural opening for major changes in the Republican nominating contest to take place. It gives time for active candidates to reassess their campaigns and for prospective candidates to make their move. In short, the “new look” Republican nominating schedule for 2012 offers scenarios that the “front-loaded” calendars of the recent past could not. The likelihood of the usual quick knockout is reduced, while the prospect of a long slog for delegates is enhanced. And who knows, the latter could feature a late-starting candidate or two, adding another unique twist to a Republican presidential nominating campaign that has already displayed considerable fluidity. The upcoming Republican presidential nominating campaign is almost certain to be much longer than four years ago. Then, John McCain had the nomination wrapped up by the ides of March, as the crowded calendar of primaries and caucuses in early 2008 was conducive to a quick knockout. This time, the accent on later-voting events makes a long competition for delegates a real possibility and the GOP contest could run at least a month or two longer than last time. There is even the possibility that a new candidate could enter the race in February and have a major impact in the array of spring primaries. Note: The delegate counts for the five pre-Super Tuesday primary states have been reduced by 50% to reflect their penalty for violating Republican calendar timing rules. 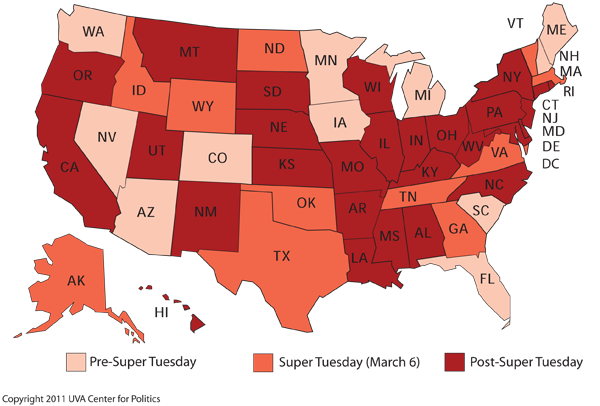 In some states, delegates are elected on different dates by different methods, and in each state and territory three delegates slots are reserved for members of the Republican National Committee. But for the sake of simplicity, all delegates are listed on the date of the state’s primary or first-round caucus action. Ohio is currently scheduled to hold its presidential primary June 12 with a March 14 filing deadline. However, there is a chance that the state legislature could reschedule the event for March 6, in which case the filing deadline was Dec. 7. Sources: Delegate totals are from the Republican National Committee. Presidential primary and caucus dates as well as primary filing deadlines are primarily from the Federal Election Commission. Both the delegate totals and presidential primary and caucus dates are subject to small changes. Dates of non-binding primaries, such as the Feb. 7 contest in Missouri, are not included.